By Travis - Egypt - 23 Oct/03 - Viewed 1593 times. We arrived in Cairo on Monday, and started the usual routine--after midnight, fending off cabbies trying to take us to a "recommended" hotel, searching the airport for an ATM and a phonecard. A little before one in the morning, we checked into the Mayfair Hotel in the Zamelek neighborhood, just across the Nile from downtown Cairo. We accepted an invitation for a drink on the balcony before heading to bed, and Mr. Shaker--a nattily dressed, domino-playing partner of the Mayfair's owner and man-about-town--joined us at our table, offering us services ranging from all-inclusive scuba and resort packages on the Red Sea to bus tickets to bogus student cards to get into museums and archeological sites for half price. We finished our Cokes and called it a night without agreeing to anything from Mr. Shaker. After sleeping late on Tuesday morning, we took a brief walking tour of downtown Cairo on our way to the U.S. Embassy to register and leave contact information. We got sidetracked stopping in an internet cafe to check the status of the World Series, and didn't arrive at the embassy (where no vehicle traffic is allowed for a three block radius) until 12:30 p.m., thirty minutes after they close to visitors. We hired a cab to take us to Islamic Cairo--a crowded, chaotic, dusty, noisy and fascinating place chock full of mosques, bazaars, coffeehouses and, most of all, people. Our first stop was Al-Azhar Mosque, established in 970 A.D. and the world's oldest, still operating university. An unofficial tour guide greeted us at the gate, showed us where to leave our shoes, gave Abi a black cotton smock to wear over her outfit and showed us around. There was a pop quiz as we went along, and Abi won the title of Doctor for her performance. He also gave us a small book about Islam which I read over the next couple of days; however, we didn't return to Al-Azhar for me to retake the trivia challenge and earn my honorary doctorate. Apparently, the mosque was severly damaged by an earthquake in 1992, and our guide pointed out several areas repaired with donations from various countries. An hour later, we were wandering through some narrow shop-lined, garbage-strewn streets, when a young Egyptian man struck up a conversation with us. After five minutes, he still hadn't mentioned a "carpet shop his brother owned" or offered any other sales pitch, we started to enjoy his company and ended up spending the next three hours touring the area with him. Abdul was very friendly, seemed to know half of the people we met on the street, and explained many things about Cairo and Egyptian culture to us. We got away from the tourist bazaar and into the back streets of the local markets--spices, fabrics, shoes, clothing, produce--you name it. Abi was developing a cold and cough, so we stopped in at the herbalist and bought a concoction to fix her up (which seems to be doing the trick). I bought a galabiyya, a traditional Egyptian garment with a top like a button-up shirt that ends in an ankle-length robe--it's very comfortable in the heat, but I am attracting quite a few stares with my light skin and blue eyes when I wear it, along with a mixture of sincere and sarcastic compliments. We made an early start the next morning, catching a cab to Giza just before eight. After forty-five minutes of traffic that makes NYC rush hour look like a Sunday drive, the Pyramids came into sight. Many more prolific writers and more profound thinkers have expounded on the grandeur of the pyramids and the sphynx than for me to add anything of note to that catalogue on this webpage. I will say that it is one of those places that are so famous and so culturally familiar that when you're actually there it somewhat feels like you're looking at it in a magazine or on TV. The heat and relentless offers of camel rides brought me back to reality. All of the 40 Egyptian Pound tickets to tour the inside of the largest pyramid (Cheops) were sold out for the day, and we had to settle for walking hunched over in the hot, stale corridors of the third pyramid. At least that one only cost 10 Egyptian Pounds ($1.50) each and I had a Tomb Raider moment of exploring a pyramid. 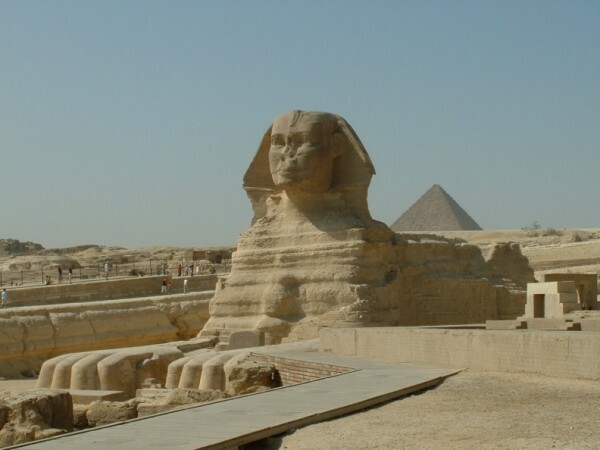 The sphynx was close by, as well as a museum in which a wooden boat over 100 feet long that had been excavated on the site had been re-assembled and was on display. There were conflicting theories as to whether the boat was symbolic to take the pharoah's soul into the afterlife or whether it was actually used to transport the corpse and treasures across the Nile to the tomb site. Either way, it was in remarkable condition for being wooden and over 5000 years old. From Giza we arranged for a cab to Saqqara where we saw the "step pyramid." Built 2000 years before the great pyramids at Giza, the step pyramid is the most ancient of the Egyptian pyramids and consists of six distinct levels, instead of the even sides of the other pyramids. We were able to snoop around some nearby temples and tombs, many of the walls covered in hieroglyphics and lovely murals. Unfortunately, two of the main attractions that caused us to visit Saqqara were closed for renovations--what are the odds that an attraction that's been open for five millienia would be closed on the day we chose to visit? That evening we went to see a dance troupe and traditional music group performance. We had seen some Sufi dancing demonstrations while in Istanbul, but these dancers were on another level. The energy level was amazing generated by the percussion-driven music and entranced performers. We had heard about a belly-dancing place that didn't open until 1 a.m., so we went to see Bad Boys II to pass the time. The fact that the title begins with the word Bad should have tipped us off, and to make matters worse (or at least a little more aggravating) the Egyptian censors had clipped and pasted, inartfully, back together different sections. For the nightcap, we headed to Club Palmyra for some real culture. The Palmyra had about twenty tables situated around a floor-level band area where middle-aged men were playing the accordian, bongo, tambourine, and a violin-type instrument. The singer (a charitable description of his talents) had a scar from his right ear to the corner of his mouth. The dancer, clad in a floor length dress, did her best to smile and act interested and be coy with the dozen locals with front-row seats. The guest of honor of one of the larger groups got on stage and danced with the lady, then broke away to shower the stage in a handful of cash. We held out long enough to see the second singer and dancer take the stage--a marginal improvement in both respects--and called it a night. We spent the better part of the following day at the Egyptian Museum, checking in on King Tut, the mummies and all the rest. The rest of Thursday was passed in coffee shops and the movies (The Hunted, another dud) before getting on a bus at 11:30 p.m. to Sharm el-Sheikh, a resort and scuba diving mecca on the Sinai peninsula.